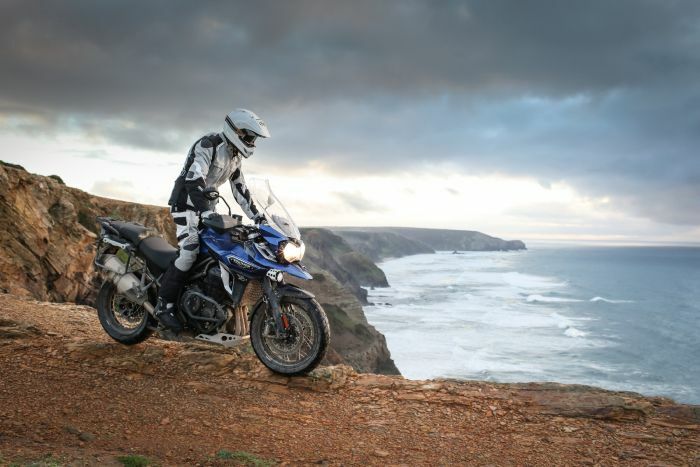 So, does the new Triumph Tiger Explorer offer remote access to the latest Samsung high-tech fridge/freezer combo? Not yet. At least I don’t think so, but wouldn’t it be handy if you fancied a quick defrost whilst mid-tour in Namibia? 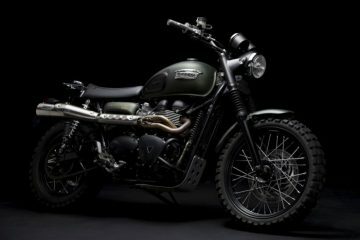 As I sat in the presentation room listening to Triumph’s boffins enthusiastically presenting a deluge of on-board technical wizardry the thought struck me that we are probably closer to gaining a handlebar mounted white goods remote control than, say, a performance of 70 miles per gallon. Back in 1937 when the original Tiger 80 rolled off the production lines I imagine the biggest concern was, “Will it conk before reaching Coventry city centre?” Fast forward to 2016 and the presentation and debate was overwhelmingly technology focused. For example, how minutely active is the semi-active suspension and how many LED screens need to be scrolled through to find the 2020 Wetherspoons Xmas menu. An overwhelming, unstoppable tsunami of motorcycle technology is upon us dear reader, and although it might appear as if I mock the relentless progress of mathematically controlled algorithms, let me assure you that I’m a fully signed up convert. After all, what’s not to like about knowing that Spoons will be offering festive pulled pork later this year, especially when that knowledge is gained mid-corner on a remote mountain road in southern Portugal. 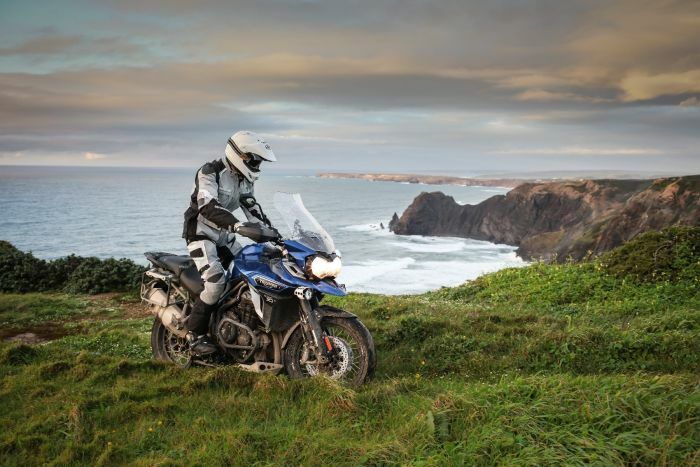 I jest, of course, but let’s make one thing absolutely clear here, the all-new 2016 Triumph Tiger Explorer has more than made up any lost ground in the two-wheeled technology race. And, having made use of all the upgrades from the saddle, I can say without a slither of doubt that the bike is a far better proposition than its predecessor, which was no slouch. 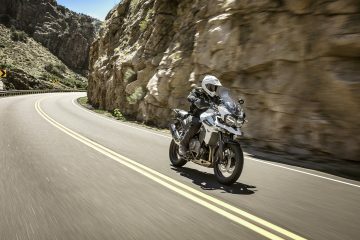 Triumph’s vision for the new Explorer was essentially to embrace state of the art technology to deliver a better and safer riding experience. The company also decided that a few old school improvements wouldn’t go amiss either so modified the frame geometry and increased power, torque, and performance in areas where riders can feel the difference. Plus, the bike has been given a contemporary styling makeover, but you’d need a keen eye to spot those changes from 20 paces. 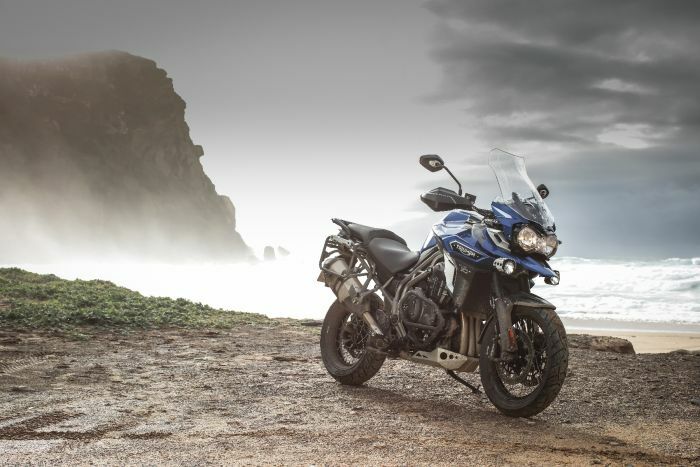 Triumph has also moved furiously into offering new models in various guises, none more so than with the new Explorer where you’ll find eight variations to induce information anxiety at the point of purchase. In short, the road focused ‘XR’ model comes in ‘XR’, ‘XRx’, and ‘XRt’ modes whilst the off-road equipped ‘XC’ model can be bought in ‘XC’, ‘XCx’ and ‘XCa’ configurations. In addition, there are low seat versions for both the ‘XR’ and ‘XC’. Essentially all models come with the same basics; frame, engine and new electronically-adjusted windscreen with the higher specced ‘x’, ‘t’ and ‘a’ versions featuring various combinations of upgrades and gizmos. It’s both a marketing policy that offers customers what they want whilst also a proven method of inducing a state of mission creep on the cash rich prospective buyer. 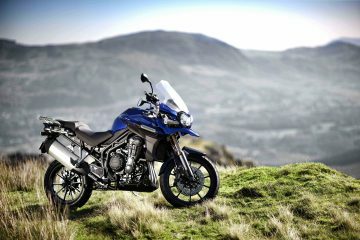 And with that in mind and having spent time on the top of the range XCa and felt the benefit of all the features, I’d be inclined to sidestep the box ticking model selection and go large based on the more straight forward selection criteria of; do I want an on-road or off-road capable machine? The list of features available on the new Explorer is legion; fully adjustable WP suspension, Triumph Semi Active Suspension (TSAS), multiple mode ABS and traction control, cornering ABS and traction control, five rider modes, cruise control, hill hold control, tyre pressure monitoring system, self-cancelling indicators, torque assisted clutch, heated grips, independently operated heated rider and pillion seats, USB socket, two 12v power sockets, electronically adjusted windscreen, ride by wire, advanced on board computer… to pick just the most obvious. There are so many sensors on this bike, measuring everything from load weight to pitch and yaw, that the only omission I could find is the one that lets you know how far away you are from a shop that sells ‘My Little Pony’. Pre-print update: I’ve just had word from Hinkley it’s on the beta list for future release. Anyway, all of the above features are accessed through a new LED instrument panel and handlebar controls which sort of hints that a co-pilot and a second, additional set of bars might be logical future upgrade too. On a more practical note, the user experience is friendly and stress-free to the point that even those who break a sweat handling a TV remote will be switching modes on the fly by the end of the showroom carpark. Well done Triumph. Swinging a leg over the bike my first port of call was fiddling with the electronically adjustable screen. Having experienced a long and exceptionally turbulent history with Triumph screens, I was keen to know from the off how to operate the mechanism to at least find a position where my eyeballs would stay routed in their sockets. I’ll let you know if I managed to retain them later. Triumph has made a few tweaks to alter the riding position from the older model and I have to say it’s both a comfy and commanding place to hang out. At 6ft 2in and on the standard seat set at the high position I could plant both feet on the floor whilst still having an open enough knee bend for the longer ride. 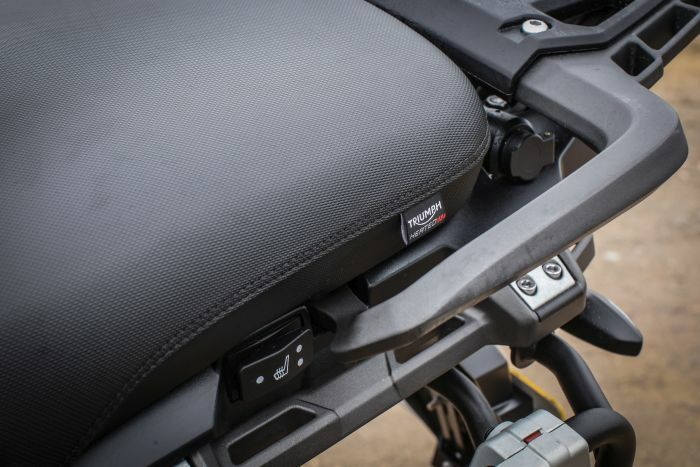 With the Explorer offering a seat height anywhere between 785mm and 857mm most riders should feel the benefits too. Staying with the lower seat option, it’s good to see that Triumph hasn’t just glued another plastic mount under the seat to accommodate the shorter in stature, but has actually gone to the trouble of offering a low seat version of the bike complete with different fork and suspension set-ups. Nice one. It has to be said that the bars look a little cluttered, but then with all those features to control something has to give and that comes in the form of the cruise control operation which is positioned on the right-hand side making it difficult to operate without taking a hand off the throttle. Other than that, everything else is to hand and easy to operate. Firing up the Explorer, the note emitted from the all-new exhaust is still, thankfully, that of a Triumph Triple – possibly my most favoured sound next to a John Bonham drum thump. The exhaust has been reduced 28% in size from the old Explorer and is freer flowing, Euro 4 compliant and offers enhanced engine performance. 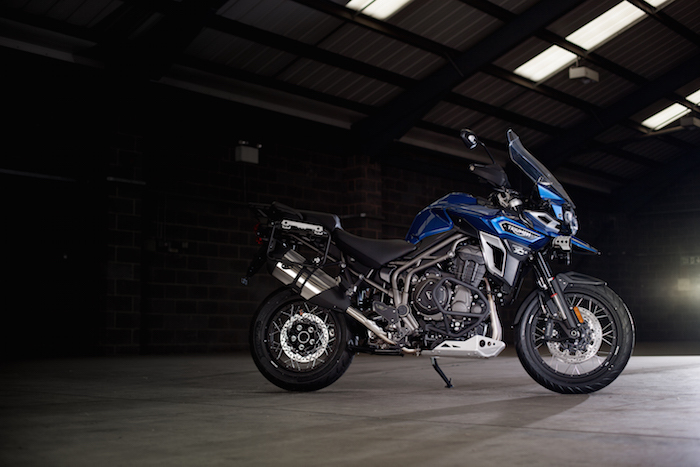 Speaking of which, Triumph claim that the 1215cc triple in the new Explorer offers more power, torque and 5% better fuel economy than the older version. A claim I’m happy to agree with having spent time flexing my right wrist on a fast paced tour of the mountain roads overlooking the Algarve coastline. Fixing the ride mode in ‘Road’ and the suspension on ‘Normal’, off we went and the first two features of note were how light the torque assisted clutch is and the smoothness and feel of the ride by wire throttle. In my view the throttle on the previous Explorer had been way too light and flighty, producing an unexpected leap forward with the slightest of movement. Top marks. Checking out the new adjustable WP suspension and Triumph’s Semi Active Suspension (TSAS) system on the move, I found it simple to operate and adjust and the feel on the ground noticeable. First off, the TSAS detects the weight of the rider/pillion/luggage and automatically adjusts the rear pre-load (up to a maximum of 210kg). Further adjustment is rider programmed with nine settings between a plush ‘comfort’ and a stiff ‘sports’ – you’re also able to switch the TSAS system between ‘auto’ for road and ‘off-road’ for trail excursions. For the slower parts of the ride into the mountains I flitted between ‘Normal’ and ‘Comfort’, switching to the stiffer ‘Sports’ setting as the pace picked up. I had no complaints about the performance of the old Explorer and I can think of even less when discussing this new version. It is fast, for sure, and the 138bhp just keeps coming right through the rev range. There’s plenty of grunt too, from 30mph in top you just need to open the throttle and off the Explorer goes without a hint of stuttering. 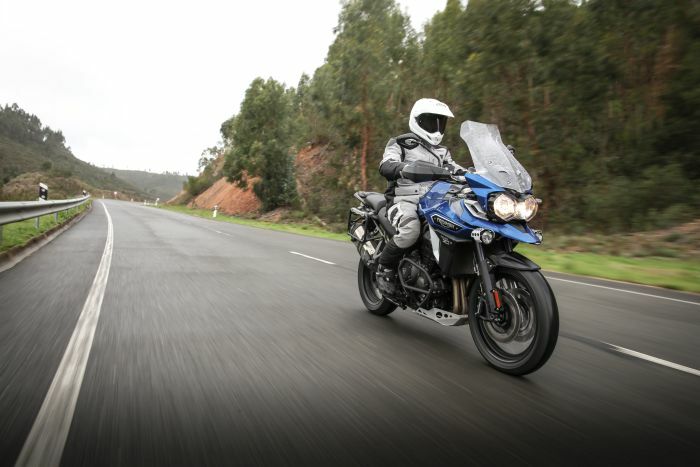 Triumph claims the Explorer is the most powerful shaft driven bike in its class, and I agree. And speaking of shaft drives, when was the last time you heard someone who’d just spent £15,800 on a bike enthuse ‘I can’t wait to start adjusting the chain’. At this level, it’s a no maintenance shaft drive every time for my money. 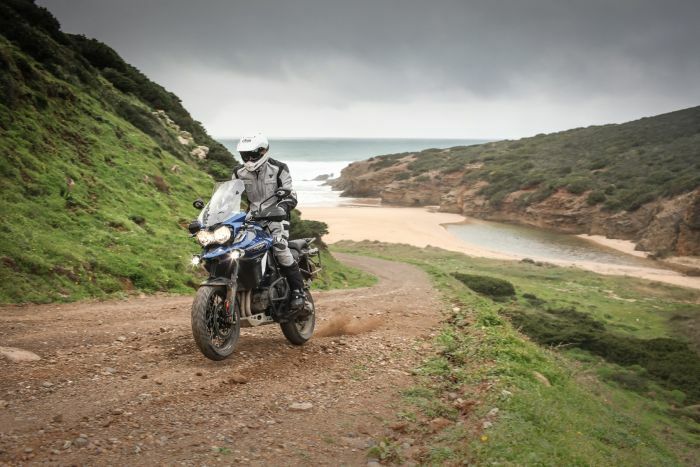 The XCa on test came with five rider modes; Road, Rain, Sport, Off-Road and Rider. 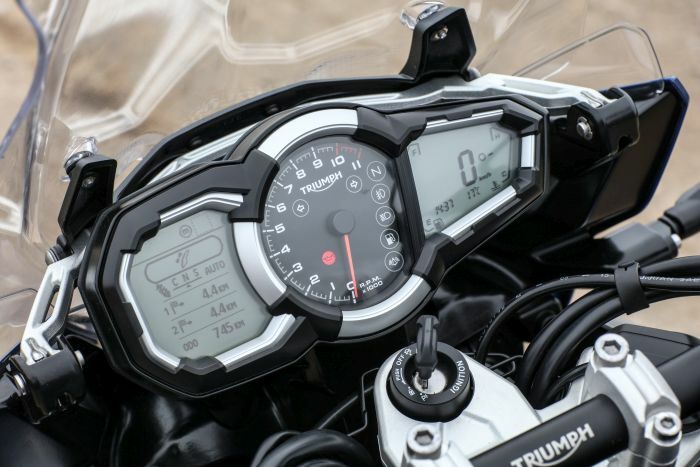 Each mode altering the throttle map, ABS, traction control and TSAS to suit conditions. The Rider mode offers the most flexibility and can be programmed to suit the individual, though I didn’t have the time to experiment with the settings. The further we rode from the urban coastal area the narrower and tighter the tarmac got. Up in the mountains the roads were wet and greasy with mud from farm traffic, plus they were festooned with debris following a heavy overnight storm. Exactly the sort of conditions where this rider’s survival instincts kick in with a substantial drop in pace and a tentative approach to corners. However, when on a press launch and riding a machine with features that adjust to suit the conditions, needs must. Switching into ‘Rain’ mode I just let the sophisticated ABS and traction control do their thing as we continued to belt along the route. The result was that I can genuinely say that I’ve not ridden so fast, with so much confidence and control on such demanding road surfaces. Flat earthers may continue to trot out the line ‘there’s just more things to go wrong’, on the other hand I’m more than happy to take full advantage of the benefits and safety of all the advanced technology on offer. In my experience, especially when you consider this bike comes with lean sensitive ABS and traction control, there’s little doubt that the Explorer is one of the safest, sure footed two-wheeled machines on the road. Photography session over, our route headed west to the huge breakers pounding the wild Atlantic Coast. 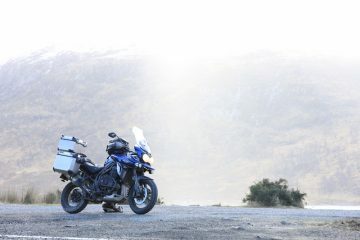 The roads were dry, the bends long and sweeping and the Explorer a pleasure to ride. 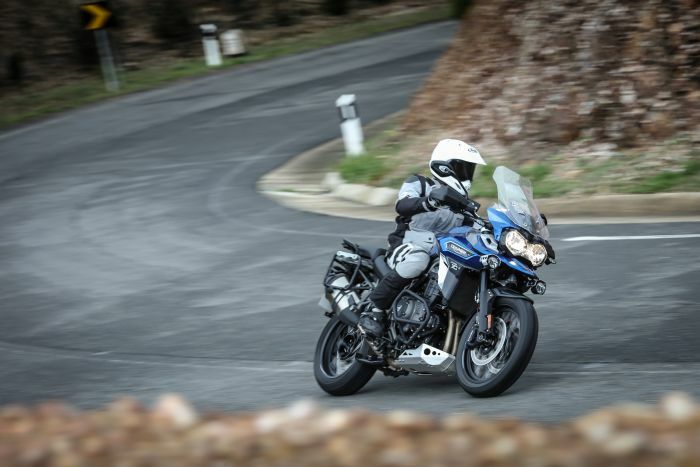 By now I had complete confidence in the bike’s on road attributes, the handling was sharp, steady and predictable, the performance blistering, the brakes and suspension spot on and comfort levels were high. I found the new seat on the Explorer a near perfect blend of size, shape and firmness and the adjustable electric screen was one of the best I’ve experienced. I’m a stickler for wearing ear plugs to the point that they go in before I open the garage door – I can personally testify that tinnitus is at the lower end of motorcycle enjoyment scale – but had forgotten to pack a set. With the screen set just below its full height there was no buffeting and almost nil wind noise to irritate my already damaged ears. In summary, this is a bike I could imagine riding on long stress-free tours in comfort. Triumph had laid on a section of off-road riding, unfortunately the overnight weather had been too enthusiastic and most of the route was flooded. What was ridable was a gravel and mud trail skirting the spectacular coastline full of deep pot holes and protruding rocks. Switching modes into ‘Off-Road’, the suspension noticeably changed, the ABS configured to ‘on’ at the front and ‘off’ at the rear whilst the traction control allowed for a little fun at the rear. In all honesty I think it’s only those on the waiting list for a lobotomy that are going to buy this £15,800 bike and head for the untamed hills but I have to say the changes that Triumph has made make this bike well suited for the rough stuff. 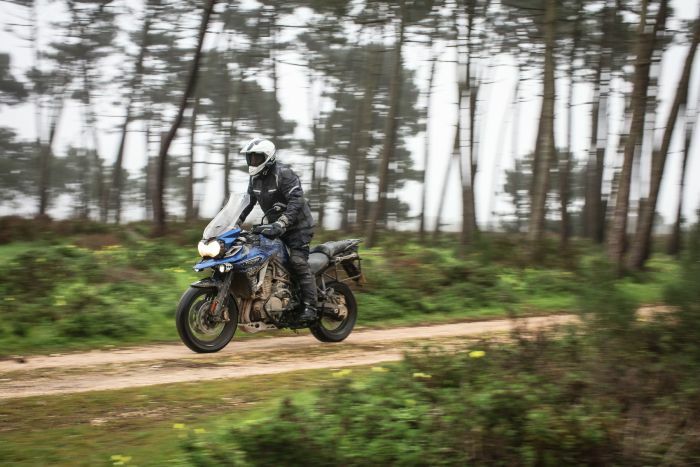 The suspension soaked up the uneven ground superbly and taking into account that we were riding on the new Tourance Next E road tyres, the level of control, feel and traction was very good. If needs be the Explorer will perform on the dirt, of that there is little doubt. Whether you’d be able to pick it up on your own is another thing entirely, this is a heavy beast of a machine. 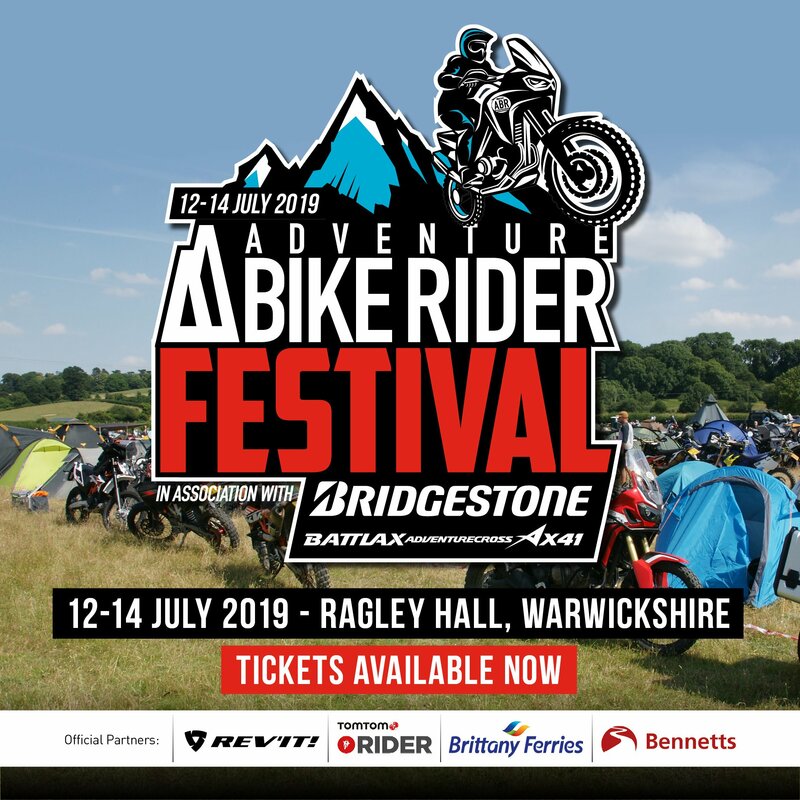 There are not many riders who can confidently spin the back end of a 258kg motorcycle out of a wet, muddy, gravel bend with complete control, but let me assure you that even a relative novice could do so on the Explorer. 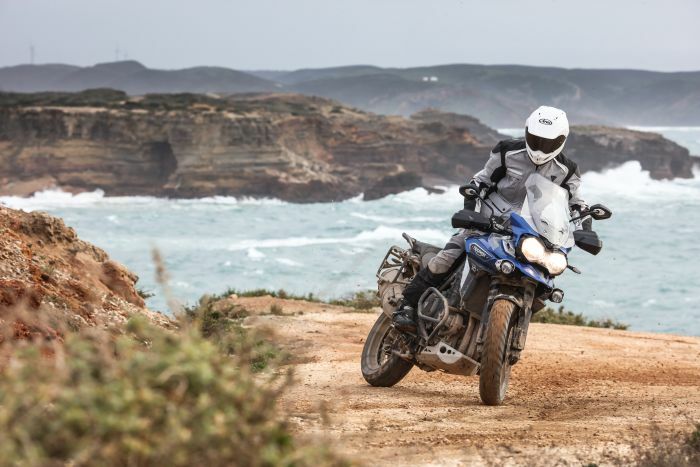 Grab a big handful of throttle, smile for the camera and just let the traction control take over, there’s no more to it – you too can go all Dakar, though I’d suggest you do so on someone else’s Explorer just in case. In conclusion, the new Explorer may not look that different from the old Explorer but it is better in just about every conceivable way, especially so when it comes to advancements in technology. If you’re in the market for a large capacity adventure bike, the Triumph Tiger Explorer thoroughly deserves a place on any shortlist. 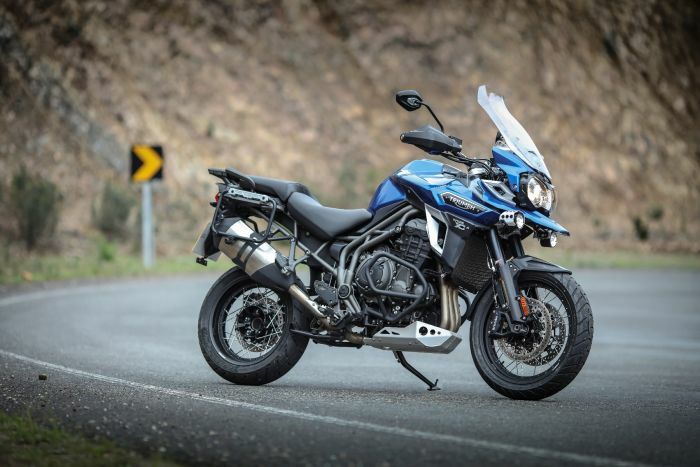 A vast upgrade to the original Explorer and an all-round first class adventure touring bike – a triumph of old and new technology just about sums it up. It’s a bit lardy and top heavy for full time city commuting, but then no more so than most big adventure bikes. However, with a low seat option most buyers should be able to benefit from both feet down stability. For all other commutes, you’ll be wishing they were a touch longer. In reality the Explorer is going to make a lot more buyers happy with its touring ability than dual purpose adventure credentials. Other than a lack of on-board coffee maker I can’t think of any reason why this bike is anything other than a very comfortable top-of-the-range adventure tourer. The Explorer costs a lot of money and it’s very heavy – two very good reasons to avoid anything gnarly. However, as with all big adventure bikes it’s more about the ability and confidence of the rider than the capabilities of the machine. If you want to know what the Explorer can do off-road then check out a Kevin Carmichael video on YouTube and be amazed. This bike can do it, can you…or more to the point do you want to? Exceptionally comfortable and reasonably frugal when ridden with restraint. And when the feeling gets you there’s bags of blistering power and speed to make big mile days a breeze. Should handle a pillion and luggage with ease. A very fine long distance tourer. Stay away from the real gnarly stuff and there’s no reason why the Explorer shouldn’t be your new circumnavigational best friend. The 10,000 mile service intervals are welcome, as are the on-board comfort and expected reliability. We’ve not had the opportunity to check out the view from the pillion seat but have no reason to doubt it’s going to be anything other than a comfy perch with little effect to overall handling. The TSAS will auto adjust for the extra weight, the mighty 1215cc triple has bags of oomph and they are going to love that heated rear seat.